Enjoy a relaxing foot massage every time you shower. Enjoy a relaxing back massage every time you bathe. 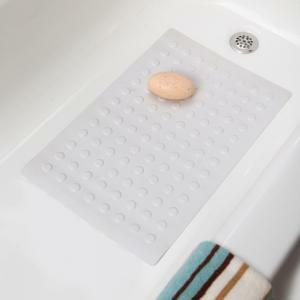 This Natural Latex Shower and Bath mat is designed for health and relaxation - Enjoy gentle pressure points on the bottom of your feet while showering or on your back while bathing. Ahhh! Whether you take a shower or a bath - or both - you'll enjoy a relaxing massage that helps melt away tension from your whole body. Engineered for maximum nonslip safety. Unlike other mats that can dangerously slip and slide, SureGrip(tm) suction cups securely grip tub and shower surfaces. Easy to clean - machine washable. This amazing shower and bath mat is made from natural latex, an environmentally friendly, renewable resource, so it is not only durable - but mold and mildew resistant. No scrubbing is required. To clean, simply put into washing maching with a few towels. Use mild soap (bleach if desired) and air dry. Size Small 22" x 14"
Size Large 36" x 18"